Reliance Industries chief Mukesh Ambani addressed AGM on Thursday on Jio's 4G roadmap and signal culmination of the USD 42-billion capex cycle it had earmarked for its other businesses three years ago. Jio to be launched on 5th September, Mukesh Ambani says, "from 5th September India will be changed"
Healthy competition is the lifeblood of a vibrant economy, its the engine that drives innovation and customer value. Team Jio aims to achieve 100 million customers in least time and set a record. Every Indian can do data-giri from September 5, 2016. Indians have come to appreciate "Gandhigiri", now every Indian can do "Data-giri". Data packs have a rate of Rs250/GB &with JIO, you can optimise to Rs50/GB, if you use more data, then you can go all the way down to Rs25/GB. 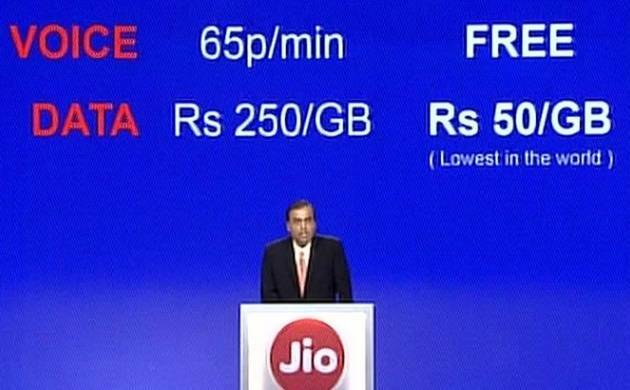 Data packs available in market have an effective rate of Rs250/ GB & with JIO, you can optimise to Rs 50/GB. JIO tariffs are designed to give full freedom and flexibility to use more data. No roaming charges across the nation for Reliance Jio customers. Our data plans go further with a tariff of Rs.50/GB. The more data you use, lower will be the rate. JIO's app booking, worth Rs15,000 for an annual subscription, will be available free for all active JIO customers till Dec 31, 2017. Great pleasure to announce a revolutionary concept for Indian market , all voice calls for Jio customers to be absolutely free. By March 2017 we will cover 90 percent of India's population. Will transform India to lowest price data market. Jio is an entire eco-system that’ll allow Indians to live digital life to the fullest. Jio will transform the lives of Indians, it will realize potential of every Indian. Mission of Reliance Jio is to take India from data shortage to data abundance. With JIO we aim to enrich life of every Indian. Demand for digital oxygen, data, is incerasing. JIO is dedicated to our PM Modi’s vision for 1.2 bn people. Indians can't be left behind as the world enters a new era. Give the youth the right environment and they will surprise us. The AGM on Thursday comes at a time when the new entrant is locked in a dispute with the existing cellular operators on the points of interconnect. Reliance Jio has accused incumbent players of not releasing sufficient interconnection ports during its test run of services while the existing operators (under the aegis of COAI) have dubbed its testing of network as an effort to bypass regulations. At the previous AGM in June 2015, Ambani had stated that 2016-17 would be the first full year of operation of the company's telecom arm, Reliance Jio Infocomm. Besides shedding light on the telecom venture, he may spell out completion details of the USD 30 billion worth of petrochemical and downstream projects. Even as it is engaged in a spat with incumbent operators over points of inter-connection, Reliance Jio has been expanding its free 90-day unlimited calls and high-speed mobile broadband trial offer to 4G smartphone users of brands such as HTC, Intex, Vivo, Gionee, Karbonn and Lava. Jio service is already available on Sony, Sansui, Videocon, LG, Samsung, Micromax, Panasonic, Asus, TCL, Alcatel 4G smartphones, and the industry estimates that its reach may now extend to about potentially 75-80 per cent 4G phone users. Under the offer, the owner of a 4G-compliant handset from any of these brands can carry it to Reliance Digital stores, including Digital Xpress and Digital Xpress Mini, and other retail stores for a free Reliance Jio SIM.